Seronok pulak baca blog org lain apedet mcm2..ade yg suka citer hal2 zaman silam, ade citer pasal anak, ade citer psal everyday life,pasal persiapan nk kawen and not to forget some frozen blogs ..
For my blog, I always speak about travelling. yes that obviously means I love to be a traveller. Alhamdulillah so far I've travelled to number of countries including which I never thought of stepping my foot on before. 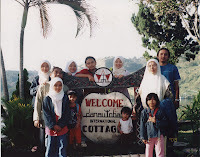 I still remember when I was young, my father liked to bring me and siblings everywhere he went for outstation. At that time, my late grandfather TokWe was still alive and he always joined us. When papa went for a meeting, we enjoyed ourselves staying in the hotel, having breakfast then together went outside exploring the place. The moment that I always remember during our vacation was everytime we stayed in hotel, papa usually received breakfast vouchers but unfortunately these voucher were limited to two persons only. That means it was kind an unfair to those who couldn't go as we are a big family contains of all big tummies. So here's the deal. The person who will go must bring back some foods for the rest who stay. how is it gonna happen? bring a bag and put as much food as possible in it. And guess who was the person? it was always ME! hahaha (because I am the cutest or perhaps got the biggest tummy haha). So I carried a beg, leave it at my table which must be located at the most hidden part of the place, had my breakfast first untill I was full (this was one of the advantages to be the chosen one), and in between, took some foods like sausage, sandwich, cakes, fruits and whatsoever foods which were possible to be carried in that bag, and secretly put them in the bag. Done! Remember to make natural-look face and went back to our room to feed others..hehehe kesian sungguh! Usually there were not so many foods I brought back, aku pun tau malu jgk..janji konyang + terpaksa menjalankan mission impossible demi siblings yg lain huhu...how i miss the good old days..
bersama sepupu sepapat dan mak sedare di Bukit Bendera. Semoga bahagia dan rumahtangga berkekalan. 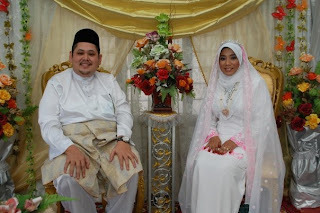 To my best friends, Mawarni, Ju and Yati (merangkap sister-in-law), I can't wait to be at your wedding day! hehe. I'll be going back to Malaysia on December for two weeks and indeed, my planner has been so colourful filled with wedding-to-attend. Hopefully everything will turn out well and smooth. I miss home so much! miss u too iemah.. one think i remeber the most about you, famili yg sangat besar.. tapi best!